April Beach is the founder of Baby Planner Inc.™, Sweet Pea Baby Planners™, The SweetLife Company and creator of Baby Savvy®, April Beach has been in the baby planning field since day one. Her authentic passion for consulting entrepreneurs and promoting the baby planning industry has proven successful and beneficial to the growth of this new field. Read on to see how April's entrepreneurial journey began. Entrepreneurship is in my blood, so my journey started in the womb. I am the daughter of super creative “parent-preneurs”. My parents chose to build (multiple) businesses to live a life of freedom. My view on “work” was completely crafted from our family entrepreneur adventures. We lived a life of traveling, exploring, hiking, and playing. My parents were known to take off “work” and pull us from school to go surfing. I grew up in California and Hawaii and lived a 10-year-old’s dream. I always knew I wanted to create the same work freedom with my children and have built my personal business model for this purpose. Flash forward: I have the best job ever! I’ve been business consulting since the late 1990s but found my passion in coaching female entrepreneur startups in the mid-2000s. I’ve been honored to work with amazing, brave “mompreneurs” and have served more than 4,000 women through my Online Programs, Business Accelerator, or Private One-on-One Coaching services. I’ve worked with fitness coaches, marketing coaches, life coaches, Doulas, parent coaches, and other moms who are serious about launching a business (versus a hobby), for profit. I am also an author, activist, non-profit founder, mom of three boys, and wife to an adventurous entrepreneur. Yes, that first year when my husband started working from home has given me enough ammo to write a comedy I’m sure you all would appreciate it! He did (thankfully) survive invading my home office space, and we now consult on some specialty business projects together. I love it! My professional purpose is to build 20 Hour Work Week Business Models for female entrepreneurs. I teach my clients to offer services in-person, virtually, and online. I do this through my online programs and my private coaching services. I work with women who want to make an impact, earn a profit, and grow as an entrepreneur while kicking booty on the mama side of life too. The business models I create take all of this into consideration. My business has always been word of mouth. I’ve never advertised my programs or coaching. I just recently built out my website, www.AprilBeach.com. I feel like this was the right time because I have so many specialty business programs that needed to be under a centered umbrella. It doesn’t matter what business they’re launching, all of my clients share similar needs and goals. They’re all passionate go-getters who are determined, hard working, brave, micro-entrepreneurs, awesome mamas, wives, and change makers too. All of my clients need programs and coaching from someone who shares their values and has mastered the business model they seek. My clients love the ease of my online programs and the authenticity of working with a business coach who doesn’t care that babies are crying in the background. I get it! I live the same life as my clients do, and I teach them to create the same business flexibility as I’ve learned to master myself with my three kids. I pour everything I have into my clients, and they can feel it. They choose me because they know they can trust me. All of my programs and services are a reflection of my commitment to their success. I’m constantly improving my skills and creating new programs to better serve those who rely on me. I’d love to invite your readers to join my free Facebook Group “Mompreneur Mastermind” where I host free, mini business lessons to help every mompreneur be a business master. This is a perfect place to connect with others who have taken my online programs and ask questions about their experiences! How did you get involved in teaching people how to start a Baby Planner business? In 2006 I launched my parent coaching business. My business grew fast with offices in seven states. It was the first of its kind and drew a lot of attention. People started pouring in and asking for help launching their companies. Because my calling was naturally “business coaching” over “baby planning”, I became on-fire to help as many women as possible! In 2008 I built my first online business coaching program, Baby Planner University. In 2009, I created the first maternity concierge program for hospitals called Baby Savvy, wrote my second book, and sold off my company to solely focus on consulting others. Today, I’ve worked with numerous entrepreneurs, businesses, television shows, news, media, and organizations in 17 countries and counting, on business strategy specifically designed for the maternity and parenting industry. What will people learn in Baby Planner University & The Baby Pro Business Plan? In 2016 I updated the original Baby Planner University and broke into two smaller programs to make business mastery easier for my clients. Here’s the breakdown of the two programs. Entrepreneurs can pick which course meets their current business need. The courses are designed to go together but are also great taken alone. Baby Planner University is perfect for those wanting to launch a baby planning business and others who want to expand an existing business to offer maternity consulting services (doulas, birth pros, other parent coaches). Take this program to master the skills and client service systems needed for a successful parent coaching business. Baby Pro Business Plan is designed to teach marketing, branding, and how to master launching a company without overwhelm. The Baby Pro Business Plan makes the business mastery side of launch clear and easy to follow. This program is designed for baby planners, doulas, and other parent coaching professionals such as nutritionists, lactation consultants, sleep coaches, and similar. What are some of the benefits to owning a Baby Planning Business? 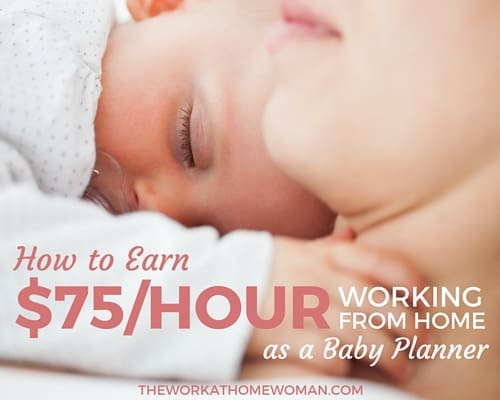 Baby Planning business benefits include the ability to work from a home-based office, freedom to create your schedule, and little to/no startup cost. Is Baby Planning for everyone? To be a stellar baby planner you must be able to deliver facts, unbiased education, family organizational strategy, and emotional support based on your clients’ choices and not your own. If you are strongly attached to one parenting philosophy, birth style, sleep approach, or other highly controversial parenting issue and you can’t keep your opinions to yourself, then baby planning is likely not for you. It’s all about supporting your clients to find their own parenting confidence, style, beliefs, and systems while making their baby prep and new parenting experience awesome and stress-free. 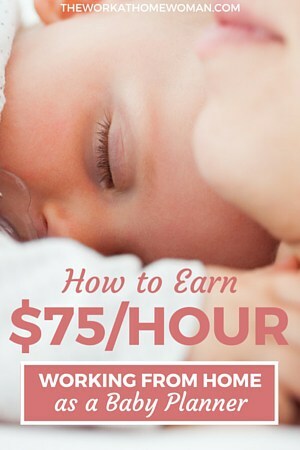 Realistically, how much can someone earn as a Baby Planner? The average baby planner charges $75 per hour. To be a successful baby planner, you need to market your business. Just like every other small business, “if you build it they will come” is totally not true. You need to be willing to work hard, utilize marketing, and put yourself out there to connect with the clients that are waiting for you and need you most. I’ve created a fun Free Business Training so people can see how much they could make as a baby planner. Anyone curious about this profession should start here. They’ll find a lesson and a downloadable worksheet to break down the baby planning business numbers and more. What advice would you give to a new Baby Planner? I would tell any new baby planner (or mompreneur in general) that to create, launch, and run a successful business, you must schedule your work time and learn to focus. Be 100 percent present at the task at hand. This means being 100 percent present with your kids and not trying to run back to your laptop, but this also means giving yourself the gift of uninterrupted work time by hiring a babysitter or family member to help. Success comes with clarity and focus, and your business must have the scheduled, focused time it needs to grow and thrive. You offer a FREE Business Starter Program – tell us about that and who would benefit from this course. The Free Business Starter Course is ideal for anyone considering a parent coaching business! Clients learn what each baby planning service is, how to project business sales for the first five years, the best apps and software for beginning business owners, and first steps to get started. Great idea. I think this is the idea where you keep growing with your experience. Will definitely try it out. I am from India mother of 3year old want to work from home as have to raise him and take care of family as well could you suggest some good opportunity for me. I am 18 years old and have a 4 month old, I started working when my baby was only 1 month old because I had finished high school when he was 3 weeks old. I hate going to work for 8-10 hours and leaving him, I want to be there to raise him not have someone else do it. I deffinately want to work from home but am scared no one will take me serious. You have inspired me to keep following my dream of working from home. I really hope I’m able to do that one day and make a descent income. I think we’d all be happier as a family if that were possible. I have about a year left before my youngest is in school to help make this happen. You can do it, Heather! Enjoy this last year before your youngest starts school and keep us posted on your journey! how i can apply for the job?? This is not a job, but a business idea you can start from home, Ruba.